This is a Sponsored post written by me on behalf of Listerine for IZEA. All opinions are 100% mine. I am the world's worst offender at the whole packing and unpacking thing known as "moving." When we moved to Georgia two summers ago, I vowed that I'd make this place pretty. Well, good intentions aside, I never got around to it. I just recently shared with you all the progress of my home office. I can't wait to be in our own home and make holes in the walls decorate to my heart's content without having to take it all back down when we move. Listerine was kind enough to provide me with a little shopping spree at Target for a Listerine bathroom makeover. I've been using the guest bathroom for the past few months as our master bath is über tiny (ironically). However, it definitely didn't exude spa or luxury like the Ritz Carlton. I think I achieved all of my goals in that shopping trip to Target. The light colors in the shower curtain, wall shelves and picture frames immediately add more "light" in this dark room. The lights above the mirror bounce off the white shelves and cheer up the space. 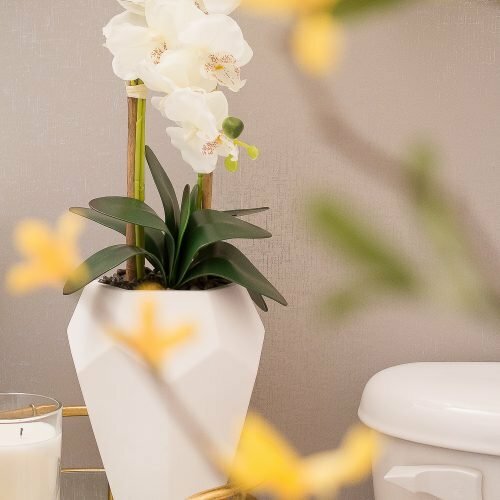 Don't you just love the pop of color that the orchids and the designer Listerine bottle provide? I know I could have made bolder choices in the color arena for the accessories, but I think the more neutrals in a room, the more serene the room becomes and the more "spa"-like. I installed those shelves all on my own, and I'm pretty proud of myself! You can find them here at Target. Did you know that you can save now with Target Cartwheel? Many of these items are 15% off through August 16th using the Target Cartwheel app. I wrote a blog post about how to use the Target Cartwheel app not too long ago. I love that I can put my perfumes, make-up brushes and some jewelry at arms' reach. (Make-up brush holder found here.) I used the frames that came with the shelves to showcase one of our an engagement photos, and my favorite shot of my wedding shoes. The holes in the walls weren't as bad as I thought. I can easily fill them in before we move out (whenever that day comes). Most of the décor is from the Target Threshold Line: shower curtain, wastebasket, basket for wash cloths (similar), and rug. I found the potted orchids near the Nate Berkus aisle. These wash cloths are within easy reach for me as I wash off my makeup. I think that cute basket, with the wash cloths, the natural wastebasket, and the luxuriously soft 100% cotton rug, give me the spa-feel I've been looking for. I have finally found my 'beauty oasis' in this rental home. 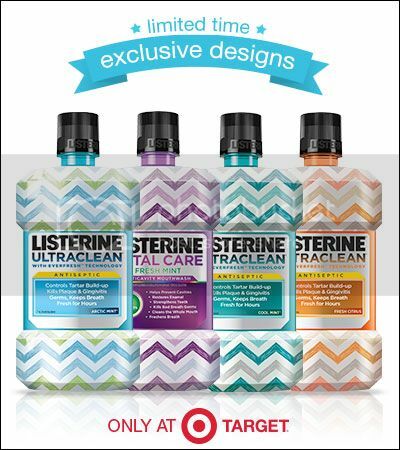 Johnson & Johnson has created exclusively designed LISTERINE® (UltraClean & Total Care) bottles that will ONLY be available at Target for a limited time. Save Now with Target Cartwheel! They come in four different colored chevron designs – perfect for keeping out and displaying in your bathroom. These fun, new designs add charisma to any bathroom. The bright colors and fun pattern create a decorative feel and are a fresh idea to add simplicity to your morning routine. The bottle’s four different colors allow room for individuality and creativity when choosing which color best fits in your bathroom. The fun colors paired with a chevron pattern gives everyone something to look forward to in the mornings! Listerine is the #1 dentist recommended brand and it gives you a cleaner, healthier mouth. For that reason, this has been the only mouthwash we've used for years. Will you be looking for this new designer Listerine bottle to brighten up your morning? Love the pops of purple! And holy cow – that’s the prettiest listerine I’ve ever seen! Thanks, Susan. I love purple! And the bottle is definitely pretty. I can’t stop looking at it (as cheesy as it sounds). Oh my goodness, you did a terrific job! Thanks, love! Tar-jay does it again! Those are such cute designs! And I love the redo. The colors are so soothing. Those colors are great! Very calming but bold where needed. Great turnout! Oh I just LOVE it! My bathroom is in desperate need of an uplift! Thanks for the inspiration! I love it! That’s so cute that the Listerine is designed to match, too!